Friends, we’ve reached that point of the academic year when packing school lunches every day feels like a *huge* chore. I mean, do these kids really need lunch every single day?? 😉 One of my secrets is doing easy meal prep for school lunches. Today I wanted to share some of my favorite simple tips plus a few pics. We are a big meal prep household because our schedules are so busy. That means I do a lot of cooking and chopping on Sunday nights to make the rest of the week go more smoothly. 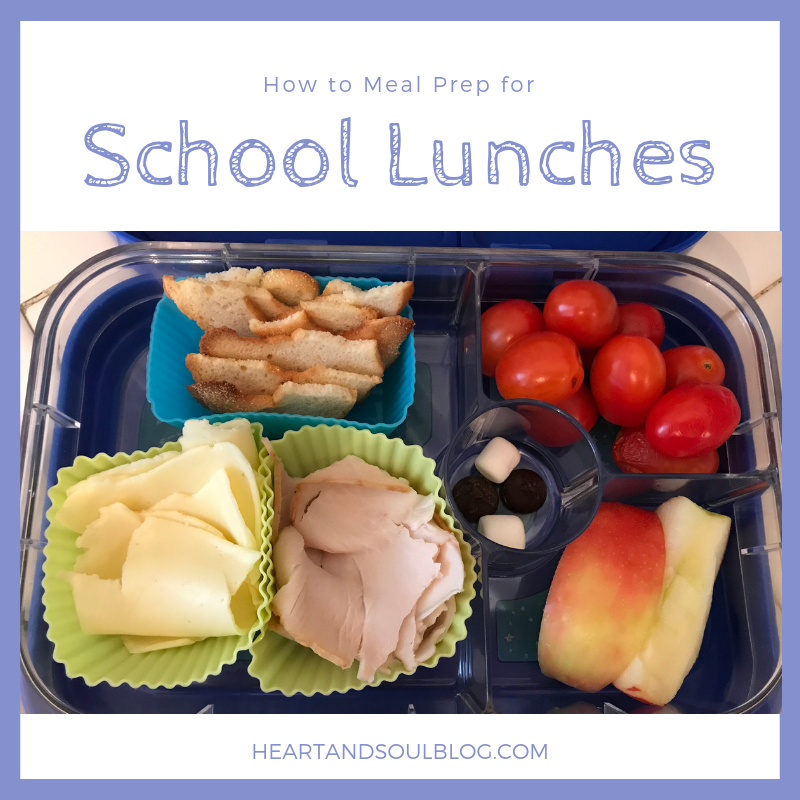 For lunches, that means slicing veggies and fruits. It also means thinking ahead as to what bits of the week’s dinners would go well in the lunch box. Some weeks, that means saving a few slices of chicken when I portion out dinner. Others it means swiping a tortilla and making a quick quesadilla while I’m cooking other things. We also have a standard repertoire that we rotate through (which you’ll see below), so I buy bread, turkey lunch meat, cheese, his favorite veggies and a few different fruits every week. 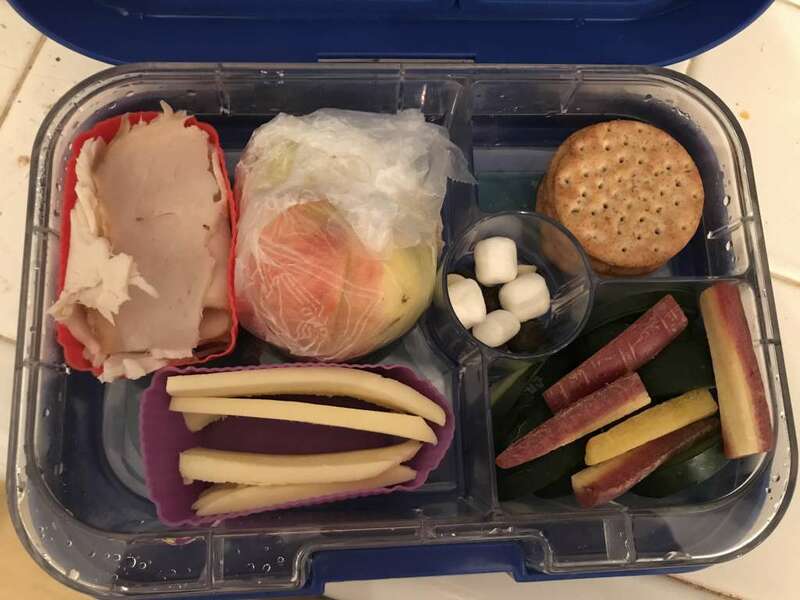 Since my son is still little, I find it easier just to pack cold school lunches even though he has access to a microwave. 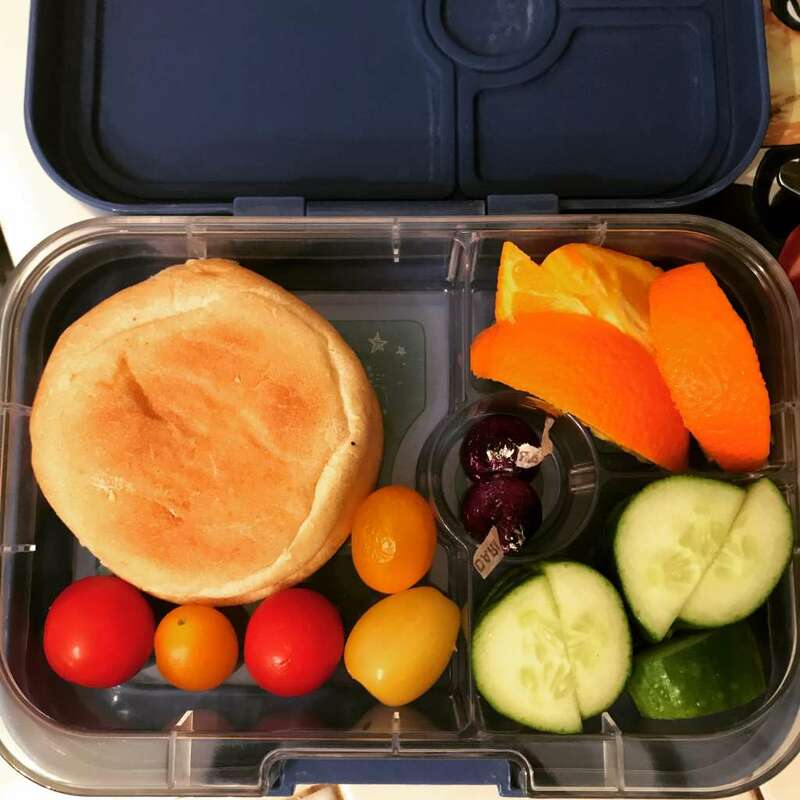 We use a bento-style lunch box and have been super happy with it. Oh, and one of the biggest favors I did for myself this school year was buying a second lunch box so that I could pack the night before instead of the morning of. More sleep and less stress? Yes, please. …is to KEEP IT SIMPLE. 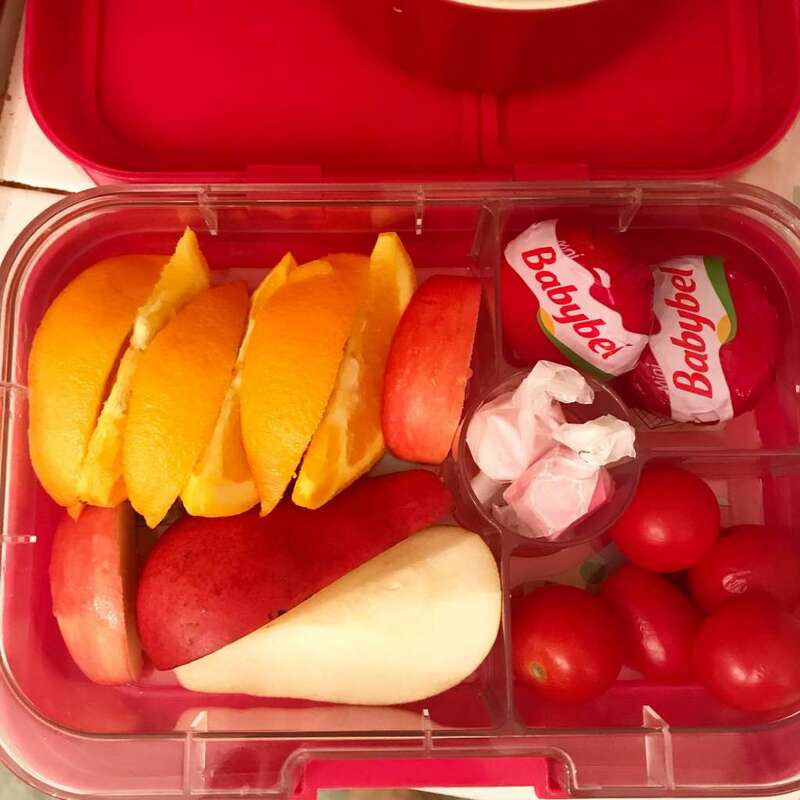 When I first started packing his lunch box, I was obsessed with color and variety. Now, not so much. I don’t pack the same thing every single day, but it’s ok to rotate through some staples. He gets a lot of sandwiches or crackers and cheese. I always make sure he has protein, a veggie, a fruit, and then fill up the rest of the container. We usually have a jar of pickles in the fridge and often include a small treat. I basically never cook *just* for his lunch, with the exception of making a quesadilla. The biggest secret, really, is slicing carrots and cucumbers on Sunday so I can just grab a handful as needed. 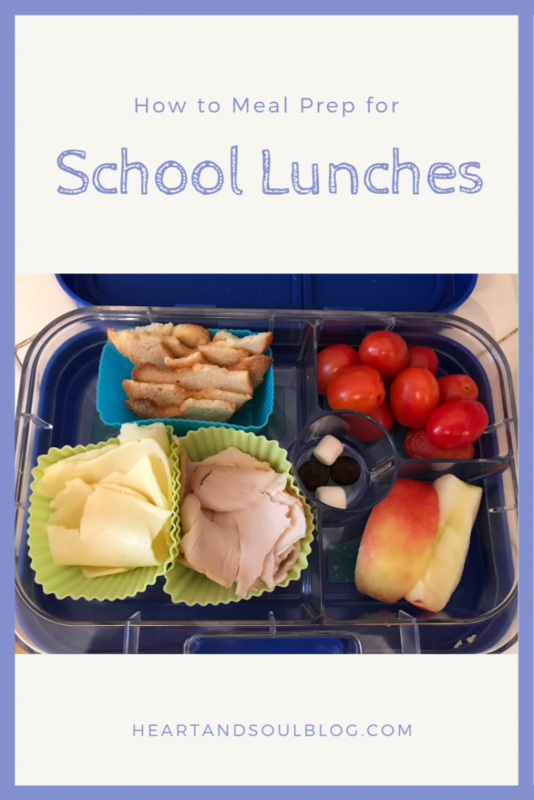 Here are 10 school lunches I’ve sent in 2018 that my son ate up! Full disclosure: he’s a pretty good eater, so I’m lucky there. And also, often these pics are taken in the dark, so I apologize for any that are poorly lit! 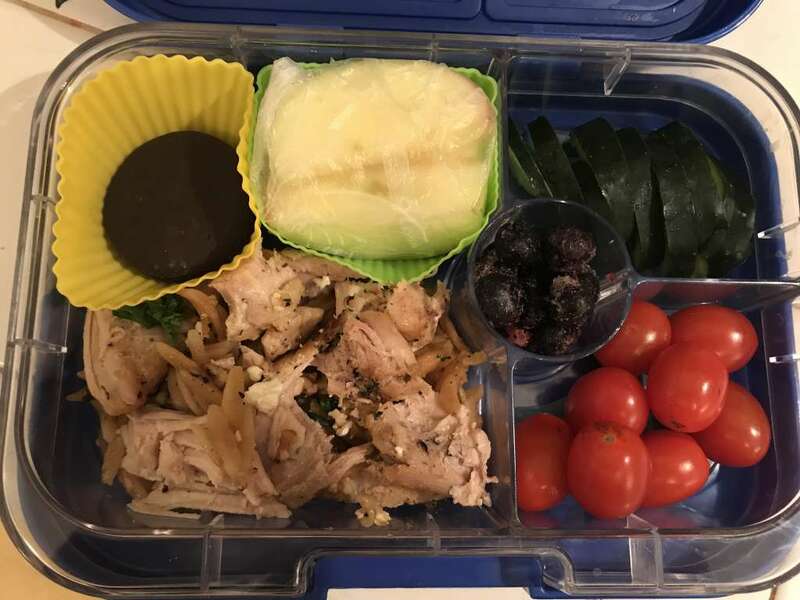 Leftover chicken and orzo, apple slices (I used to wrap them in plastic, but I don’t do that any more), grape tomatoes, cucumber slices, frozen blueberries, and a chocolate mint cookie. Orange slices, pear slices, apple slices, mini cheeses, grape tomatoes, and two pieces of taffy — color theme! 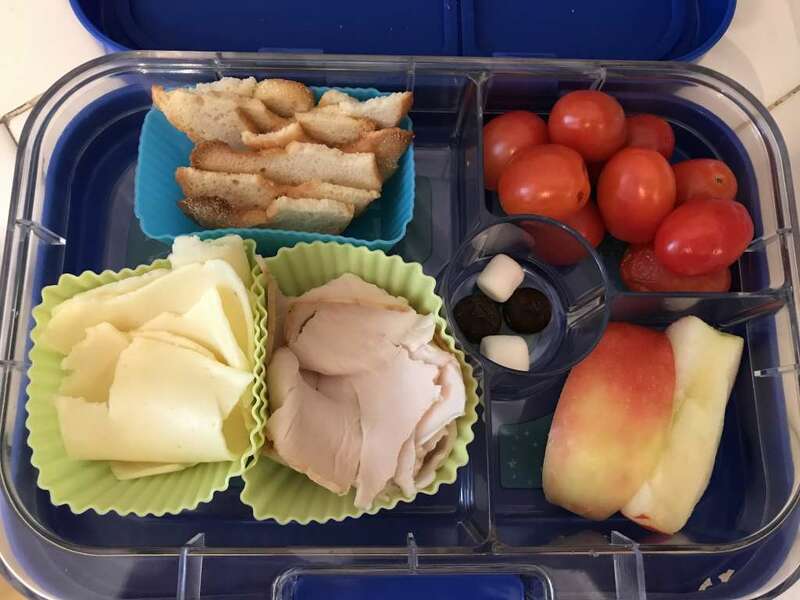 Turkey, cheese, bagel chips, grape tomatoes, apple slices, and chocolate chips/marshmallows. 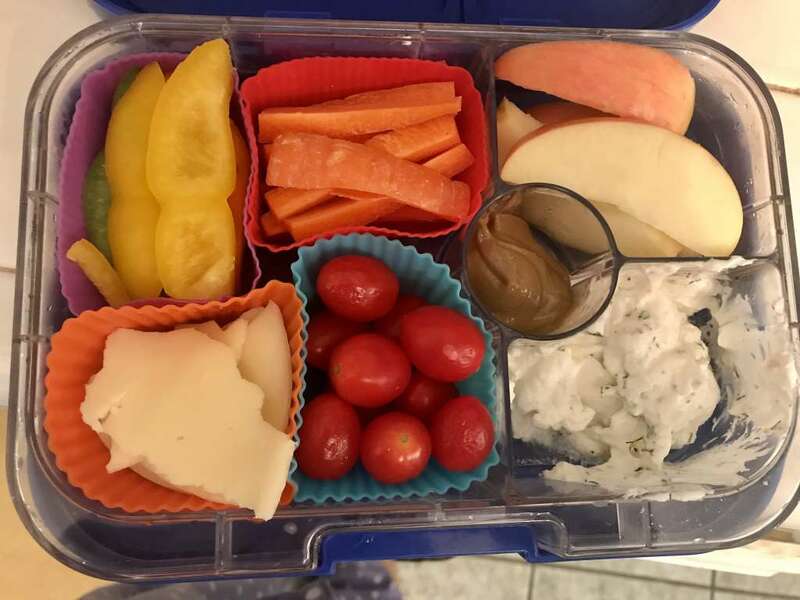 Pepper slices, carrot sticks, provolone cheese, cherry tomatoes, apple slices, homemade ranch dip (Greek yogurt + dried herbs), and sunflower seed butter. Cheese quesadilla on a whole wheat tortilla, a couple of baked chips, grapes, peach slices, baby carrots, and dark chocolate Kisses. 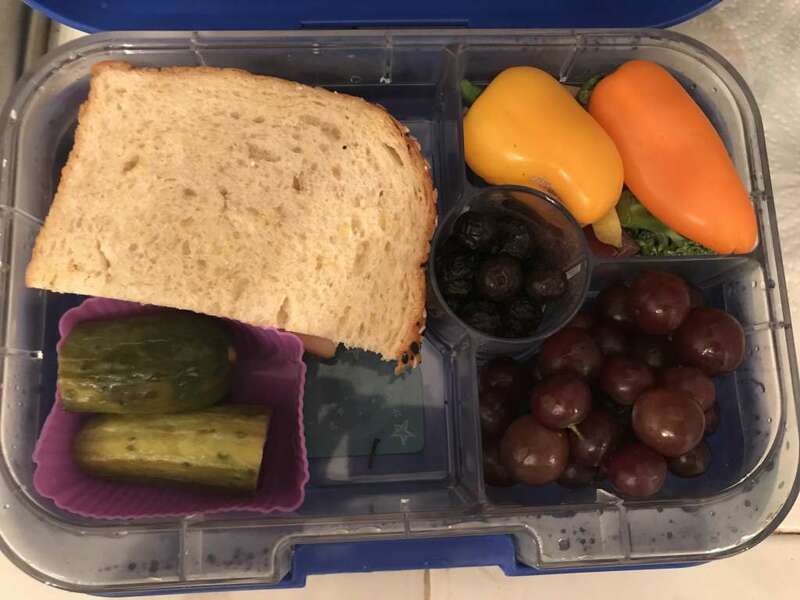 Turkey and cheese sandwich, pickle, peppers and broccoli, grapes, and frozen blueberries. 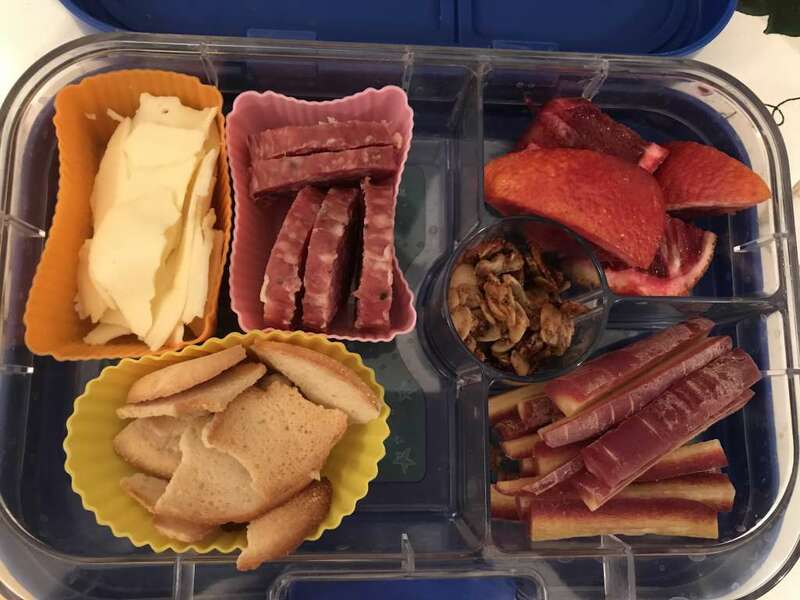 Provolone cheese, sliced salami, bagel chips, sliced blood orange, purple carrot sticks, and homemade nut-free granola. Sunflower seed butter and jam sandwich on an English muffin, a few mini tomatoes, cucumber slices, orange slices, and two dark chocolate Kisses. 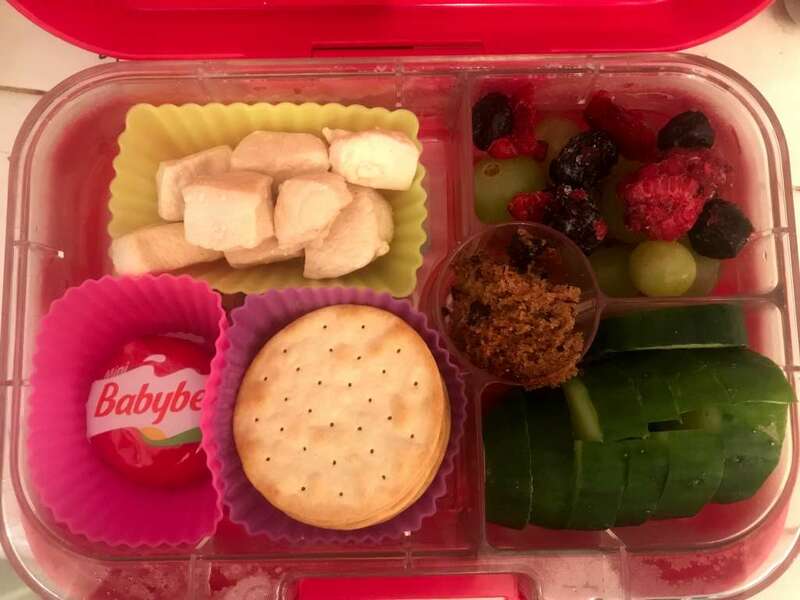 Leftover chicken, mini cheese, crackers, grapes and frozen mixed berries, cucumber slices, and a small piece of chocolate chip banana bread. 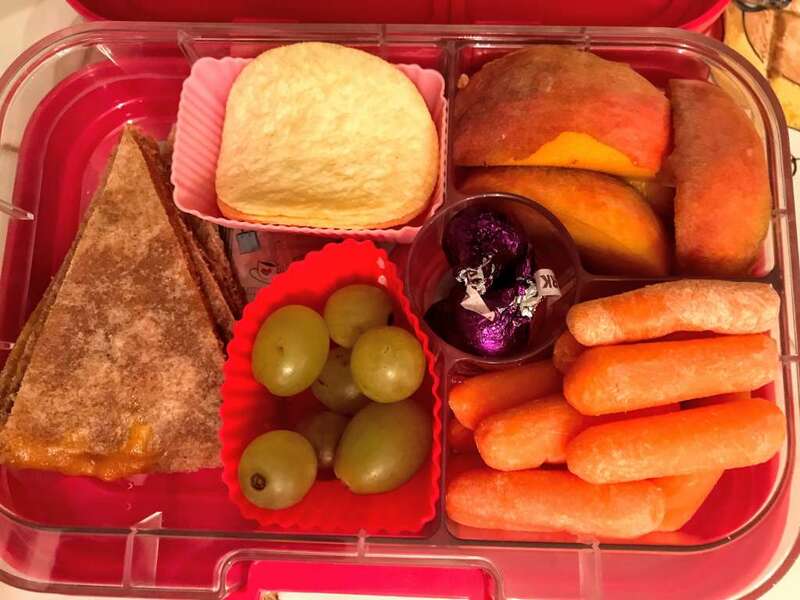 Turkey, cheese slices, sliced apple, crackers, sliced purple carrots and cucumbers, and marshmallows with white and dark chocolate chips. Want more inspo? I have a Pinterest Board for that!